Home / Latest Technology News / 5,500-Year-Old Megalithic Tomb Discovered In Ireland Heralded As "The Find Of A Lifetime"
5,500-Year-Old Megalithic Tomb Discovered In Ireland Heralded As "The Find Of A Lifetime"
Archaeologists have made an astonishing discovery of a 5,500-year-old megalithic tomb in County Meath, Ireland. The discovery was made by an agri-technology company called Devenish in partnership with the University College Dublin (UCD). They had been digging at the site for more than a year, and have now revealed their latest exciting finding in the region. The team discovered two burial chambers hidden under a large stone cairn. Around the cairn they found the remains of six kerbstones, which likely formed the perimeter. One of them was covered in Neolithic carvings. Two other satellite tombs were also found. 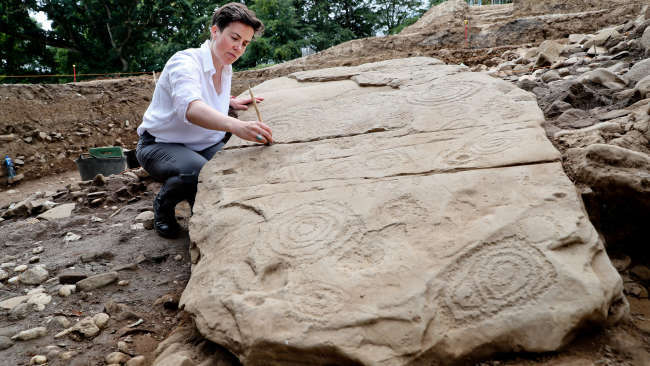 “For the archaeologists involved in this discovery, it is truly the find of a lifetime,” Dr Clíodhna Ní Lionáin, Devenish’s lead archaeologist for the project, said in a statement. The specific location of the find was the Brú na Bóinne complex at Dowth Hall. There have been a number of archaeological discoveries made here in recent weeks, including the unearthing of a previously undiscovered monument thanks to a drought. It’s thought that these monuments were created by some of Ireland’s first farmers, with the discovery hoped to shed more light on the people and culture of the era. The historic site will be preserved for future generations to see. Brú na Bóinne means the “palace” or “mansion” of the Boyne, and is located close to the east coast of Ireland about 40 kilometers (25 miles) north of Dublin. The region contains three passage tombs – Knowth, Newgrange, and Dowth – built about five millennia ago in the Neolithic or Late Stone Age. The tombs contain the largest collection of megalithic art (relating to large stones) in Western Europe. The region of Dowth Hall contains other interesting discoveries too, including a Late Neolithic henge, a Bronze Age enclosure, Early Medieval enclosures, and Late Medieval settlements. People will be able to tour the megalithic finds of the latest excavation during Heritage Week, which takes place from August 18 to 26.